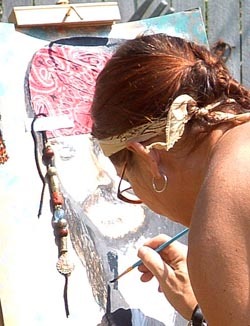 Working en plein air, Kate applies acrylic paint to a multi-media portrait that also includes textiles, leather and ceramics. As an artist, I think outside the box. Need a visual presentation that goes beyond the ordinary? I'll draw on my experience and skills with traditional art media, digital techniques, or a combination of both, to create unique work just for you. You don't have to settle for what a stock-photo service can supply. 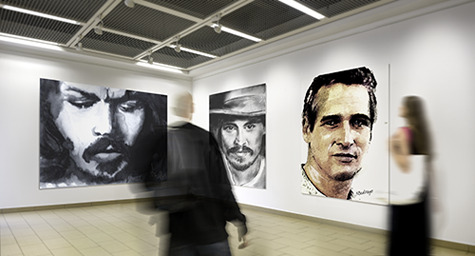 Original art, done in traditional or digital media, is dramatic, unique and affordable. I'm expert at hybrid art forms, combining two- and three-dimensional elements, using digital techniques to alter a painting or drawing, or giving a photograph the look of a watercolor, chalk drawing or even a comic strip. Have something in mind but not sure how to describe it? Send me an email or give me a call. I'll help to define your project and create a unique, dramatic work of art. Periodically I offer a short two-session course on how to draw a good likeness, using a photograph and a simple grid system. These classes are available for a modest charge in the Wilmington, NC area, and are taught in our Community Arts Center. For more, to portrait drawing course page. This virtual gallery shows original watercolors I painted, based on photographs. This is just one example of what I can do for you.